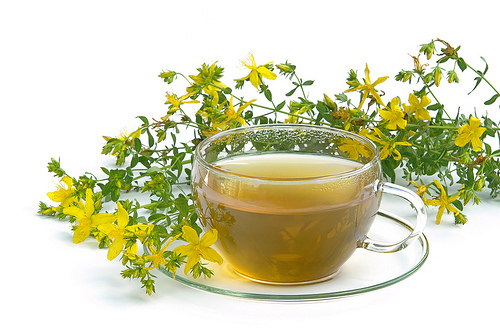 Can St. John's Wort Truly Help Your Anxiety and Depression? Here’s my short review on this yellow flowered plant known as St John’s Wort (hypericum), and the pros and cons when it comes to trying to use it against depression and anxiety. I’ve had mixed feelings on the effectiveness of this herb, and want to lay it all out for people because there seems to be a lot of confusion in the never ending search for things that help with depression symptoms and anxiety disorders in general. How does St John’s Wort actually work? St John’s Wort contains important compounds in it that have medicinal qualities such as Hypericin, which is believed to have a similar effect to antidepressants. It affects the levels of serotonin, dopamine and norepinephrine which make up the neurotransmitters in our brains. In my experience, it was most effective during my mild to moderate days of depression. In more severe cases of depression, the herb was not very effective for me at all (but that doesn’t mean it won’t work for you). Mike, who is a very good friend of mine, tells me that this herb has been a small miracle for him when it comes to his sleeping disorder, the release of tension in his body and his concentration levels and there are also studies that would definitely support his claims of the effectiveness in these areas. In ancient times, many herbalists as well as doctors used this herb as a sedative as well as treatment for malaria, and in my experiments with it, I can say that it is put to great use when I had a burn or an insect bite as well. St John’s Wort affects the nervous system as well, and has done a good job for me with my digestive system. The anti-viral properties are utilized to strengthen our immune systems and have also been known to be very effective against colds and flu. Could it just be a placebo? I truly believe that if you are suffering from the mild to moderate range of depression, and are wondering what would be helpful and would rather take the natural route instead of antidepressants, than give St John’s Wort a shot. In my experience, there have been times where it has kicked in and I’ve felt the effects suddenly, and other times I’ve taken it for long periods of time with no effects whatsoever. But I will tell you this, when it comes to side effects this herb beats antidepressants by a long shot and I’ve experienced substantially fewer side effects through this natural herb. Of course, most doctors will tell you not to waste your time with experimenting with this herb when it comes to depression, but I say give it a shot it may be the natural alternative that you have been looking for. Would I ever take it again? Definitely, due to the effects St John’s Wort has had on my mild to moderate depressive symptoms in the past, there is no doubt this would be my first choice for a solution. For depression, the standard dose of 300 mg 3 times a day worked well, but keep an eye out if it starts to bother your stomach and I definitely don’t suggest taking 500mg twice a day or 600mg once a day, spread it out in small doses and remember to take it with food. How long did it take before I noticed any changes? In my experience using this herb against depression, it took about 4 to 4 and a half weeks for St. Johns Wort to really start kicking in, but again, everyone is different and it’s not uncommon to hear changes in mood and depressive symptoms in 2 to 4 weeks after taking the suggested dose. What do some studies show on the effectiveness against anxiety? Researchers have used a dose of 600 mg per day for six weeks on 151 people with sleep related problems. There was a significant reduction in generalized anxiety seen in this St John’s Wort-treated group. Also, 500 clinically depressed patients with high levels of generelized anxiety were tested by researchers using 500 mg of Valerian and 600 mg a day of St John’s Wort (a good combo) the group reported significant decreases in anxiety symptoms, and when in fact upping the dose and retesting, had reported even better results. When should you not take St John’s Wort? If you are currently on an antidepressant especially any SSRI’s such as Prozac, for example, it is recommended you stay away from St John’s Wort. These types of interactions could result into what is called Serotonin Syndrome or Serotonin Toxicity which is an excess in serotonin activity. Also, if you are pregnant or under the age of 12 stay away, or if you have substance abuse problems or are dealing with addictions to alcohol or other drugs, then taking St. John’s Wort could cause severe drug interactions. Although there are still many studies being conducted to evaluate the true effectiveness of St John’s Wort, I can truly say that I experienced better benefits from this herb then I did from antidepressants. Why? Not sure really, maybe it was the idea that I was taking something natural, and didn’t have the fear and confusion of taking something artificial and chemically that was doing who knows what to my body. I also thought it would be worthy to mention that I used this herb in tea form as well as pill form, not sure which was better but again try them both and see. In conclusion, St John’s Wort gets two thumbs up from me when used for mild to moderate depression as well as mild to moderate anxiety, but of course always used as an effective sidekick as you tackle the root of your problem. I’d love to hear your own personal journey with St John’s Wort so join the conversation in the comment section below. I use it all the time and I think your evaluation was dead-on correct. It does help with my mood and overall feeling of well-being; but I would never rely solely on it. In conjunction with a myriad of things I use in my battle against anxiety (mental, physical, spiritual, and others), this is just one component. I would give the same advice to others: it’s worth a shot. Try it and see if it helps. great feedback Joe thanks for sharing, you say you’d never rely on it solely and that is so important you’re so correct. My pleasure. I read your blog religiously and feel good to see we are on the same page in how we think. I think it’s wonderful that you are able to help so many people! Likewise Joe, i’m always on the lookout for anything that says JOE. I was just wondering if you had any info on negative side effects? I heard that depression and anxiety can get a lot worse when you stop taking this which has put me off trying it. Trust me Kim. Coming off of st johns wort is a dream compared to the other options that big pharma has for you. Also to this day having helped over 21,000 people wordlwide through anxiety, rarely has there been a person who has come back to me with side effects from coming off of st johns wort. Thanks for the info, I am all about trying all natural ways to treat anxiety and panic and have not yet tried this. Have you heard of lemon balm? I am currently trying lemon balm tea that is also supposed to help with anxiety and the nauseus feeling that comes with it and it has been very helpful. You know it truly depends on where you are in regards to your anxiety Christina. These are all sidekicks to taking care of the daily routines and rituals that anxious minded people undertake on a daily basis, that is actually the main cause to their anxiety. I would also agree that it works very well in treating mild to moderate depression. I was first on Prozac for 18 months, then when the depression came back I wanted to try something with much less side effects. I would add that I found St John’s Wort increased my sun sensitivity as I have very pale skin and burnt more easily – it did mention this as a possible side effect. St John’s Wort helped me trust that alternative methods might work, so I then tried Reiki, crystals, Bach Flowers, meditation, etc, etc! Great feedback Lisa thanks for sharing. This is great! Thank you!! I brought st johns wort many weeks ago but was a but hesitant to try it after reading your blog it has given me the confidence to give it a go! Great to read! Thank you for your comments!